The US House of Representatives is holding its first hearings on climate change in over a decade this morning. Here’s how you can watch them remotely. 6 February 2019 | The US House of Representatives is holding two simultaneous hearings on climate change this morning — one in the House Committee on Energy and Commerce, which oversees the Environmental Protection Agency (EPA), and one in the House Committee on Natural Resources, which oversees the Department of the Interior. Both hearings are scheduled to begin at 10am Eastern Time. The Energy and Commerce hearing is entitled “Time for Action”, and is being live-streamed (and archived) here. The Natural Resources hearing is entitled “Climate Change: Impacts and the Need to Act”, and is being live-streamed (and archived) via Facebook. The hearings come as veteran Senator Ed Markey (D-Mass.) and freshman Representative Alexandria Ocasio-Cortez (D-N.Y.) prepare legislation designed to flesh out Ocasio-Cortez’s proposal for a “Green New Deal” that will eliminate fossil fuels in transport and manufacturing. While serving in the House of Representatives, Markey co-authored the Waxman-Markey cap-and-trade bill that Republicans killed ahead of the 2009 climate talks in Copenhagen. Next week, the House Science, Space, and Technology Committee will conduct a hearing entitled “The State of Climate Science and Why it Matters,” and Rep. Cathy Castor’s House Select Committee on the Climate Crisis is set to convene soon as well. This is the reconstituted House Select Committee on Energy Independence and Global Warming, which existed from 2007 to 2011. 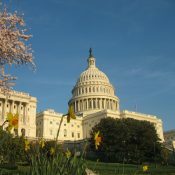 Click here for coverage of the hearings and the New Green Deal. Declan Foraise is a retired forester who primarily covers land use issues in Europe and Latin America.